The best season to visit Japan by general agreement is sakura season. A popular tourist magnet is the former Japanese capital, Kyoto. Its historical significance, well preserved culture and old buildings as well as its over 1600 temples, the constant events and wonderful surrounding nature will ensure a fantastic visit. So if you come in spring, you might be turn where to go first. 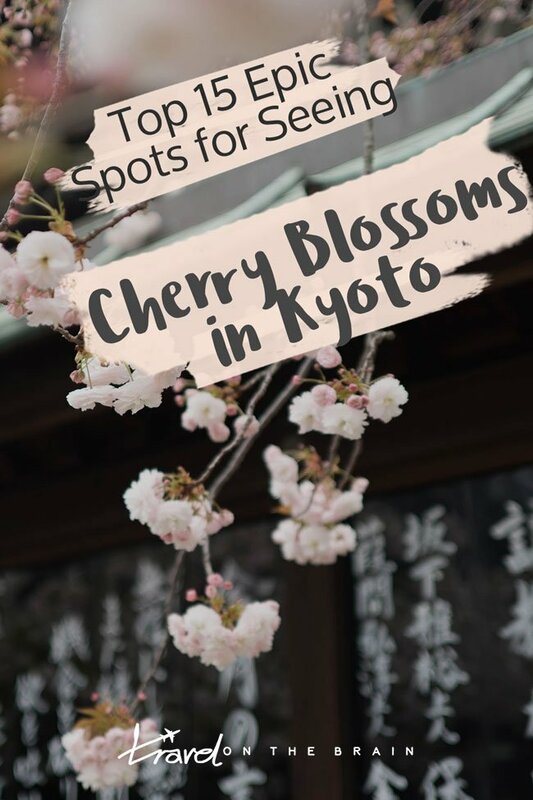 Luckily, you can easily combine Kyoto sightseeing with the best spots for viewing cherry blossoms in Kyoto. 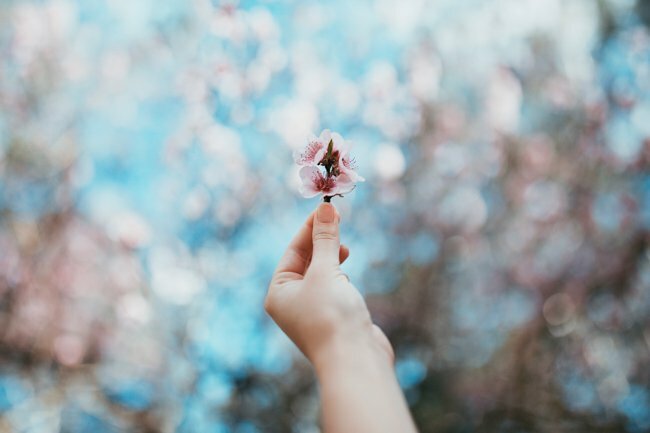 3 How Far Should You Book in Advance for Cherry Blossom Season in Japan? 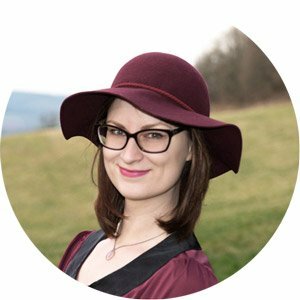 21 Is Kyoto Cherry Blossom Season Worth it? When in Kyoto and to get the authentic Japanese experience, stay in a local Ryokan. Those are traditional Japanese guesthouses and a lot of them provide Japanese dining experiences as well. The majority are located in the historic Gion District and as such come with the respective price tag. If you want to treat yourself, they are well worth it. For starters, try the The Hotel Kiyomizu Gion in the traditional Japanese style. Plus, you can enjoy free (alcoholic) drinks during Happy Hour. If you wish, there is the option of being served a classic Japanese breakfast, too. Mixing the traditional with a modern minimalist touch, expect a luxurious stay at Sotetsu Fresa Inn Kyoto-Hachijoguchi. This is also a great hotel for business travellers and digital nomads as rooms include working desks. If you are backpacking Japan on a limited budget, try a local hostel, such as Piece Hostel Sanjo, which gets excellent ratings across the board. It is seriously affordable for Japanese prices and it offers female only dorms as well. Solo travellers love this place! 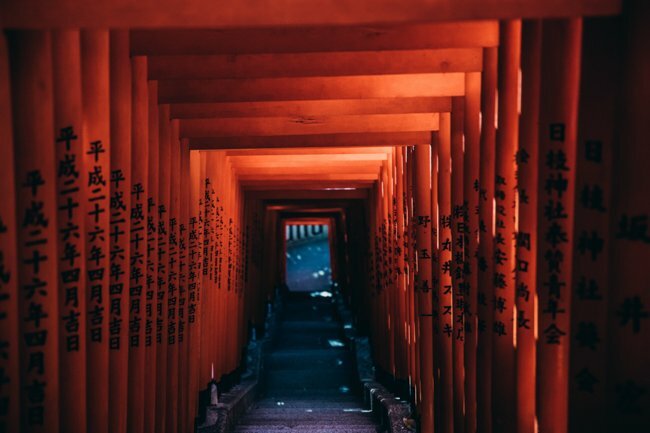 While this hostel is located two minutes away from the Nishiki Market, its partner hostel Piece Hostel Kyoto allows you to stay right next to the train station, from where you can easily reach the famous Fushimi Inari-Taisha torii gates. Visit in spring is a very vague recommendation and the blossoming times change each year. A good idea is to check the year’s previous cherry blossom report to get an idea around what time to expect the blossoms. For 2017 it was April 7 to 15 and for 2018 it was March 28 to April 5. So you see, there is quite a vast difference, especially since cherry blossoms last for about a week. Your best bet is to look into seeing the cherry blossoms in Kyoto during the last week of March or the first of April. I recommend staying for at least a weekend in Kyoto to have a better chance of good weather and better bloom. To avoid the insane crowds underneath the sakura trees – and trust me, they will be there – visit under the week and super early in the morning. This also goes for regular sightseeing, not just for Kyoto cherry blossom spots. If you get up before sunrise, you can also see the soft glow of the early sun rays illuminate the pink petals. Win win! How Far Should You Book in Advance for Cherry Blossom Season in Japan? 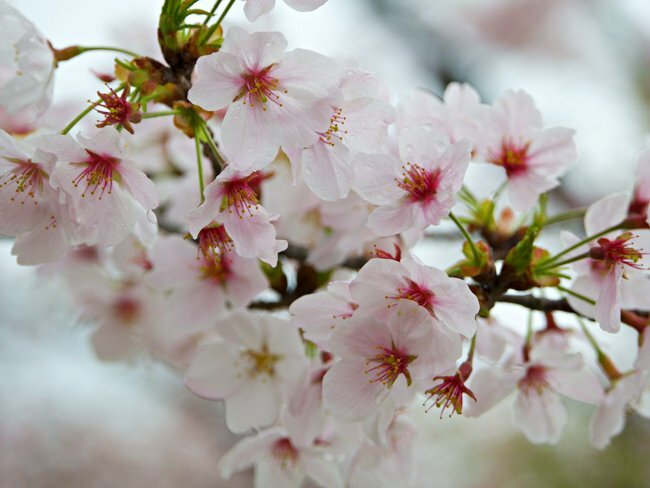 As soon as you know you will experience the Japanese cherry bloom, book your accommodation! The flight you should monitor over a few weeks. The closer to spring, the more the prices skyrocket. Here’s an example: Booking a hostel stay in February can cost as low as $10 per night but when I checked the same hostel for a stay in late March, suddenly costs were above $30! The price difference gets even more dramatic with hotels. Also, a lot of it will be booked out after February. Ideally, start booking everything at least half a year in advance. If you don’t shy away from walking, you can easily cover much ground when sightseeing Kyoto’s city centre. Gion district isn’t very big, the Imperial Palace is basically around the corner and a lot of Kyoto’s temples and shrines aren’t scattered too far either. Getting to Arashiyama and Inari Shrine, for instance, requires the local bus system. To get to Kyoto from Osaka, you can simply take the train, which leaves regularly and doesn’t cost much. South of Kyoto’s train station, you can find the bus terminal, from which you can easily enter the bus network. It is rather extensive and no matter where you are, you can find a bus to hop onto. That being said, get a map of the bus network so you see where interchanges are possible. Oftentimes you need to walk to another stop to change lines. If in doubt, ask a local at the stop. Japanese are very helpful and should they not understand you, in most cases they will find someone who does for you. The weather can be quite temperamental during spring. One day you could be lucky and bask in sunshine and 23°C temperatures. On other days, you might get caught in seemingly never-ending rain in Kyoto (here’s what to do then). Generally expect the range of temperatures to between 10 and 20°C. It can be as low as 4°C! Hours of sunshine are only between 4-5 hours per day. Therefore, your best bet is to bring a light raincoat and umbrella with you and layer up with a cardigan. Wear comfortable walking shoes and bring a hat with you for colder days. There are a lot of local kimono rental shops in case you want to try this experience. 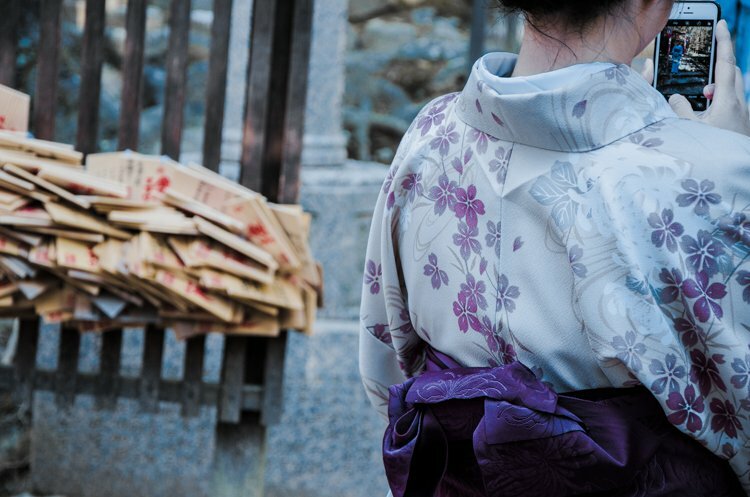 If you want a lasting Japansese souvenir, however, invest in a pretty yukata. This is a casual summer kimono that the Japanese wear for special outings or on the occasion of cherry blossom season in Japan. Match your sandals, accessories and bag to the yukata. This path can get seriously crowded but that’s due to its exceptional beauty. Imagine a quietly bubbling stream at your feet and a canopy of pink overhead for two kilometres. If you start early, it can be the most relaxing walk ever. 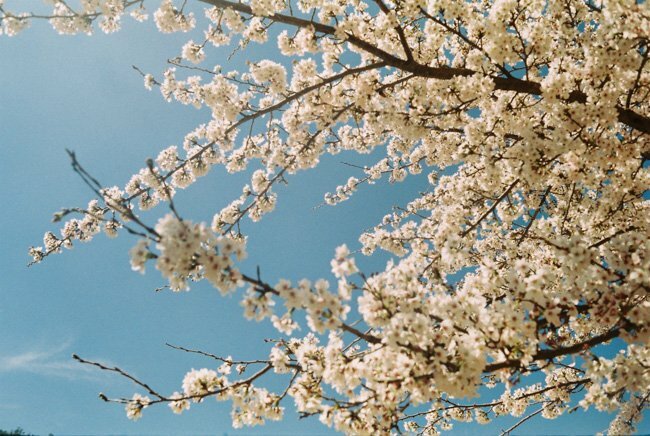 You will definitely understand the pronounced love the Japanese have for their sakura. After Gion, Arashiyama is the second most popular district in Kyoto. It lies a little outside and you will feel like you are in rural Japan. You’ll love it! 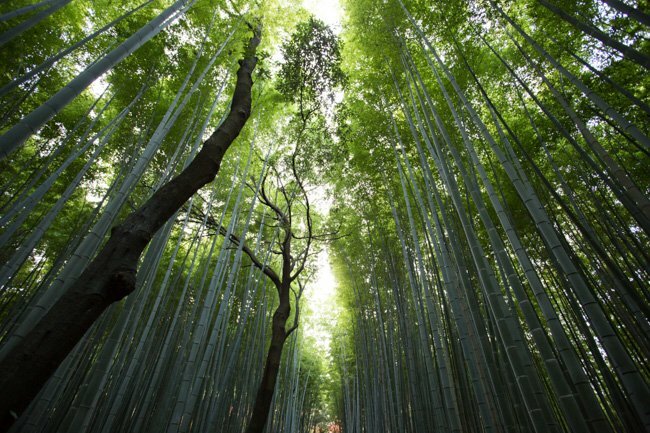 Take a stroll along the cherry blossom tree lines river walks and walk up to Kameyama-koen Park, then head to the famous Bamboo Forest. Near the train station, you can also admire the art project Kimono Forest. However, while you are at the riverside, don’t miss out on stepping into the local shops. A lot of them offer special sakura themed foodie treats and you can sample a lot of them. Don’t forget to try sakura mochi balls. After strolling through the beautiful Gion district and maybe even attending the famous Miyako Odori geisha performances in April, you gotta head to Maruyama Park. Start at Yasaka Shrine (八坂神社) and then walk up to Chion-in (知恩院). This Buddhist temple dates back to the 17th century and provides a wonderful experience of cherry blossoms in Kyoto. 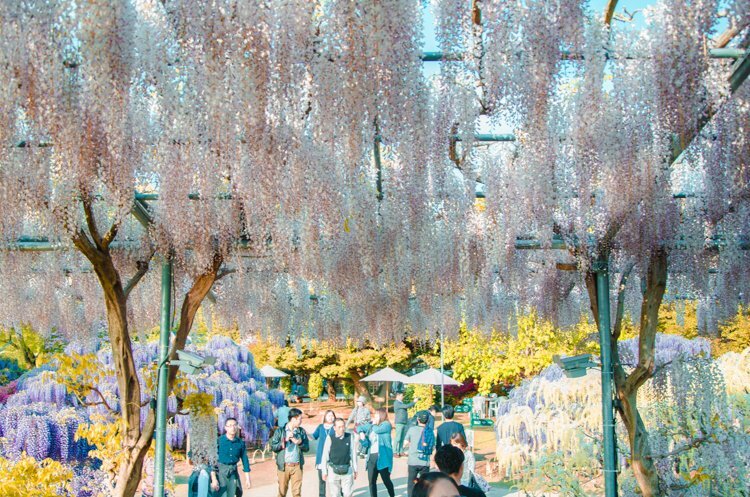 The gravel paths are lined up with food and entertainment stalls, blue picnic blankets are laid out underneath the cherry blossom trees and you can fully enjoy your day. The Kyoto Imperial Palace was once the ruling headquarters of Japan. Sadly, it burnt down in 1855 but luckily was restored completely and can now be visited. You don’t even need a tour to walk around the Sento Palace grounds. It is basically like a public park. The buildings, however, are off limits. To see the weeping cherry trees, walk over to Konoe Pond in the Northwest corner of the park. Besides the Imperial Palace and the Sento Palace grounds, a few other historic sites are located within Kyoto Imperial Park, including the Kaninnomiya Mansion, a former residence of court nobles that is open to the public in the park’s southwestern corner. Not far away stands a small branch shrine of Miyajima’s famous Itsukushima Shrine on a small island of a pond. Another nearby temple in Gion is Kōdai-ji. Its surrounding park is much smaller but it is rather quaint and possibly not as overcrowded. On top of that, you can partake in a traditional tea ceremony at the tea houses onsite. This botanical garden is a true sight. 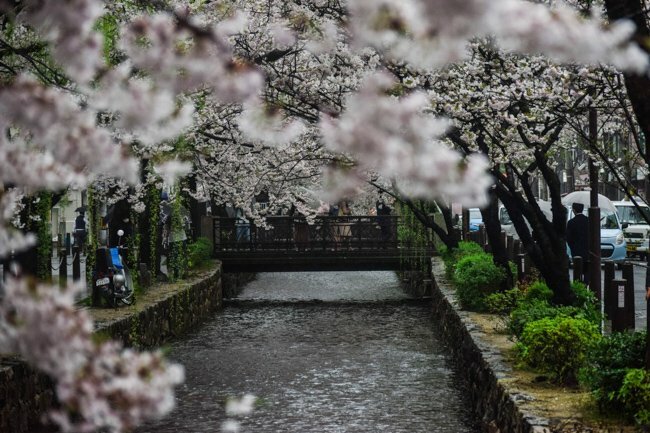 Located right next to the the Kamo River, you expect more than 500 cherry blossom trees in full bloom. The park dates back to 1924, making it the oldest and most comprehensive botanical garden in all of Japan. If you return in autumn, marvel at the deeply red maple trees. Admission for adults is 200 yen and free for free for children, junior high school students, senior citizens (70 years and older), and the disabled. Parking is 800 yen. If you want to see Lake Biwa and Higashiyama, don’t miss out on the Keage Incline, another top local spot for Kyoto sakura sights. This place is actually a former railway pass that stretches for 582 metres but has been discontinued. When the cherry blossoms are in full swing, the Keage Incline is a must visit. At other times during the year, you can happily skip it. This Buddhist temple is a little outside of Kyoto but is such a marvellous example of Japanese gardening expertise and also includes a five-storey pagada, I had to include it. The origins of Daigoji are traced back to 874 when a Buddhist monk Shobo built a hermitage and soon discovered a well full of the spiritual water named Daigo. The temple site underwent plenty of reconstructions and additions over time but the religious principles developed here lead to the important Shingon school Ono branch. Did you know that Kyoto gets its water supply from Lake Biwa? The water is channelled via Lake Biwa Canal, of which Okazaki is part. Plan an afternoon walk underneath the cherry blossoms nearby the vermillion bridge and then cross over to see the Heian Shrine. Another branch of the Shingon sect of Buddhism can be found at Ninna-Ji. This time, though, it is the Omuro school. This temple dates back to 888 and was actually founded by the then retired emperor Uda, which lead to one member of the Imperial Family serving as Ninnaji‘s head priest over the course of several centuries. This gave it the nickname Omuro Imperial Palace. Nowadays, it is a World Heritage Site and can be visited free of charge. Entering the Goten palace buildings costs 500 yen. Another small Kyoto embankment worth seeing the cherry blossom trees bloom at is Kiya-machi Dori. Visit especially at night to see the stark contrast of ink blue sky and bright pink, illuminated cherry blossoms in Kyoto. You can easily spend an hour here. 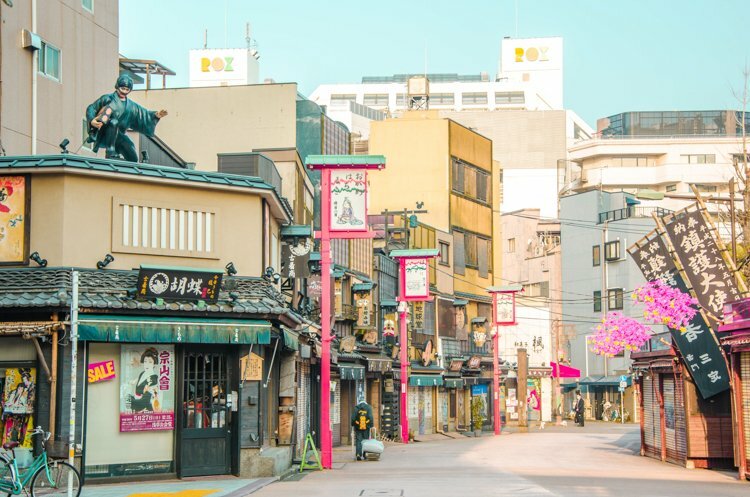 As this street is full of bars and restaurants, you can satisfy your appetite for delicious local Japanese cuisine as well. This is one of the larger shrine complexes of Kyoto. As the shrine is located near Ritsumeikan University, be aware that you will find many student groups all over the area and it can get very crowded. That shouldn’t stop you from a visit though. 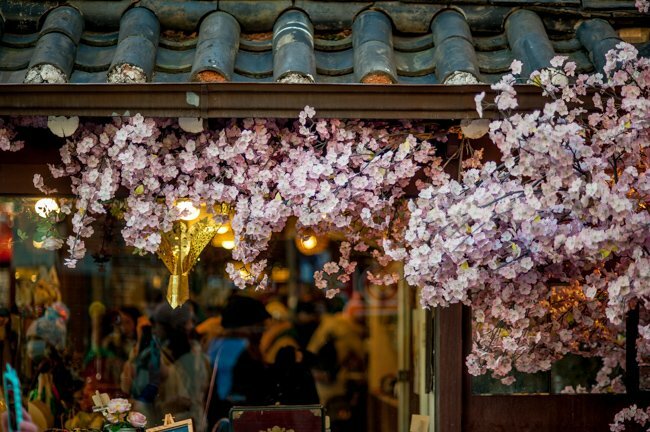 Simply pick a free spot underneath the Kyoto sakura and enjoy the social aspect of hanami, flower festivals. Speaking of festival, the actual celebration is held second Sunday in April at the mausoleum of Emperor Kazan, which leads to a procession in the afternoon. Another UNESCO World Heritage Site ist he fabulous Kiyomizu-dera. Its name means “Pure Water Temple” because it was built by the Otowa Waterfall the eastern hills of Kyoto. There are three different streams from the waterfalls and drinking from each of them is said to have specific health benefits. From the wooden stage that protrudes 13 metres above the hillside below, you have the best view over Kyoto’s sakura and maple trees. This is THE must see shrine in Kyoto and not surprisingly, you can also find spectacular cherry blossoms at the shrine site. Still, what Fushimi Inari is most famous for are its hundreds of red torii gates up and down Mount Inari. In case you are into weeping cherries as apposed tot he regular cherry blossom trees in Kyoto, then hit up Haradani-en Garden. Here, you can see a lot of them in one spot and Kinkakuji Temple is also close by. If you are lucky, you can reach it by the rare bus M1. Otherwise, you have to rely on twaxi or uber. The entrance fee is 1200 yen on weekdays and 1500 yen on weekends and during holidays. Is Kyoto Cherry Blossom Season Worth it? If you had to choose one Japanese city only to visit during the famous cherry blossom season, I would pick either Kyoto or Tokyo. There is just so much to see in such a relatively small city. The temples and shrines are absolute stunners and surrounded by hundreds of flowering sakura trees, they stand out even more. 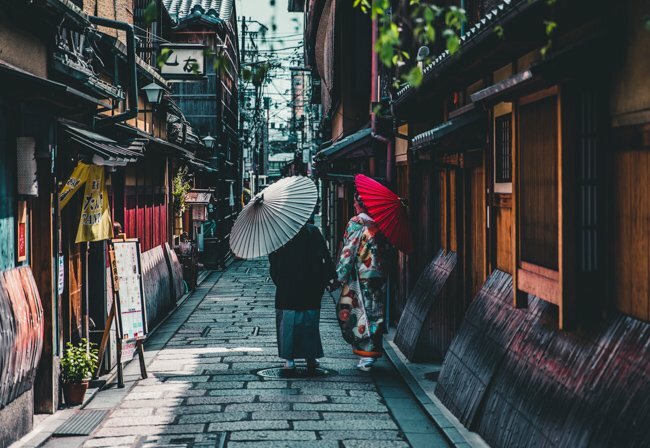 Getting around is easy and even if you have only one day in Kyoto, you will be treated to quite the spectacle in the city centre and Gion district. 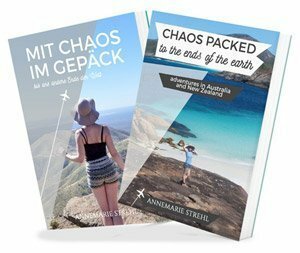 Definitely put it on your travel bucketlist! 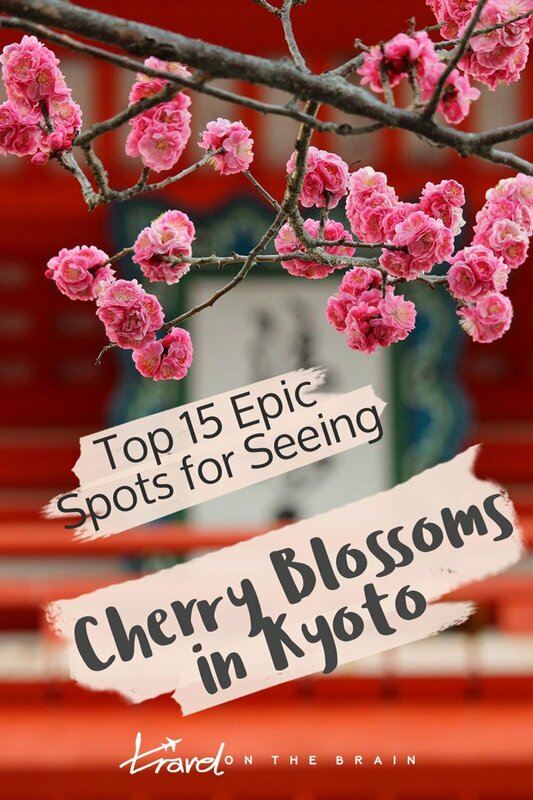 Did you know about these Jawdropping Cherry Blossom Spots in Honshu?